Meh, sounds crap. Give me the real version any day! Interesting find, though. haha, it sound like the difference between the real game and the beta is the beta sounds fun and enjoyable. No Spider, eh? ;) Spider kinda is the plot. I'd like to see how a MMXCM like that would work - I guess they'd just emphasize the Rebellion's actions more. Well, If you check the first 2 trailers for the game, there are many things in them, (especially the first trailer,) that you dont see in the game,. such as the action triggers look different, and such, but ive always wondered about that, after one day finding that very picute on google, but much smaller. 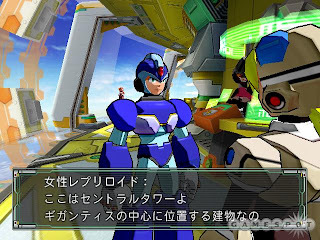 and I really dont dbout it, as in the concept art, especially Botos' size comparison to X, they show a picture of X in regular armor. BTW, dunno if anyone noticed this, but the reploid behind the counter is the reploid that attacks X before you meet Spider. and its the teleporter arcade too. which makes it funnier. Will any links to where to obtain this be posted here if you find them, Protodude? @Pluvius: Definitely. But, I still have had no luck finding it.